How does a Muslim village boy who faithfully attends Quran classes and goes home to the works of Lao Tzu and Confucius, grow up to view the world — and his country? 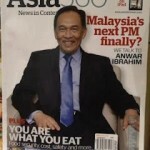 The scope of Dato Seri Anwar Ibrahim’s worldview is matched by the breadth of his political ambitions. Having risen from the ashes, the leader of Malaysia’s opposition is raring to prove his mettle at the upcoming elections.